Citation: Shetty GN, “Accurate, Precise Microlitre Dosing With Prefillable Syringes for Opthalmic Injections”. ONdrugDelivery Magazine, Issue 94 (Jan 2019), pp 28-31. Other drugs are also used for treatment of eye infections (and the resulting endophthalmitis), uveitis and post-cataract prophylaxis. It is estimated that, in 2016, six million intravitreal injections were administered in the US alone. With an ageing population and increasing incidence of diabetes, the number of such injections is expected to continue to rise. 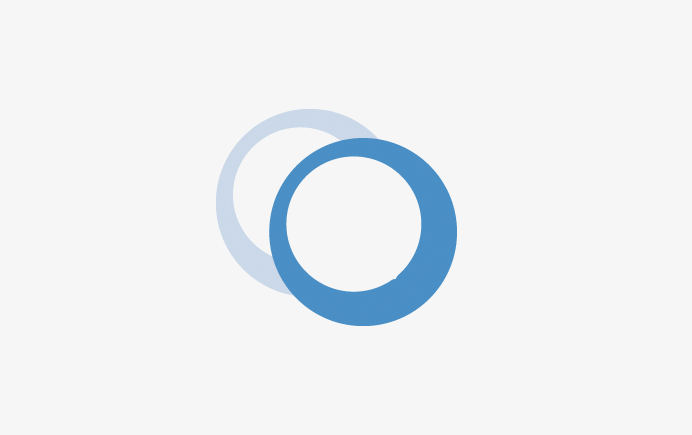 Currently, there are two commonly used, approved anti-VEGF agents – Eylea®, marketed by Regeneron Pharmaceuticals (Tarrytown, NY, US) in the US, Bayer (Leverkusen, Germany) in Europe and Santen (Osaka, Japan) in Japan; and Lucentis®, marketed by Genentech (San Francisco, CA, US) in the US and Novartis (Basel, Switzerland) outside it. Eylea® and Lucentis® represented 26.3% of all Medicare Part B spending in 2016.1 Despite their relatively small unit volumes, these high-value drugs represent an important part of the healthcare system and have drawn biosimilar interest. In addition to the anticipated biosimilar activity in this space, there are a number of novel drugs in the clinical development pipeline. Reducing drug fill volume (compared with a vial), potentially increasing effective drug product yield for a given drug stock solution. Reducing downstream packaging costs associated with injection kits, thereby streamlining supply-chain operations. Novartis launched the Lucentis® PFS in 2014 and Genentech launched its own in 2017. Regeneron Pharmaceuticals has indicated a launch of a PFS for Eylea® in 2019. 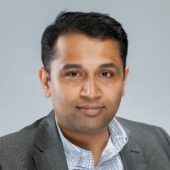 For biosimilars and other novel drugs in the development pipeline, PFS for ophthalmic injections shouldn’t be merely a consideration for product lifecycle management. Clinicians have indicated strong preference for prefilled delivery options. 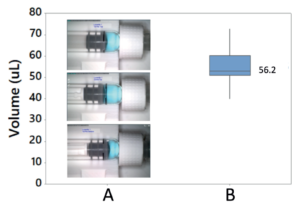 Figure 1: User data with 0.5 mL PFS for a 50 μL dose: sample images of variation in dose start position (A), and measured dose for 21 users (B). The typical dose volume for ophthalmic injections is 50 uL, but delivering such a small dose volume with a conventional hypodermic syringe or PFS is challenging.6 The plunger travelling only a millimetre results in the dispensing of 17 μL and 32 μL, in 0.5 mL standard PFS and 1 mL long standard PFS, respectively (Table 1). Hence, any slight error or variation at start-of-dose or end-of-dose results in a disproportionate degree of inaccuracy. Setting a dose in a conventional system by aligning the plunger stopper with a marking on the syringe barrel tests the limits of human capability. Data from a user study involving retina specialists illustrates the limitation of a conventional PFS in this regard (Figure 1). Table 1: Injection dose stroke sensitivity. A syringe having an internal diameter smaller than that of a standard 0.5 mL PFS could potentially improve accuracy when delivering a microlitre sized dose. However, integration with standard pharmaceutical fill-finish infrastructure would be challenging with non-standard PFS systems. Any consideration for a non standard PFS would need significant capital investment in PFS component development and development of custom fill-finish equipment. The same issue arises with the injection of a 50 μL dose using 1 cm3 hypodermic syringes, which are of a similar internal diameter to 0.5 mL PFS. This is widely reported in the literature7 and was highlighted in a presentation at the American Academy of Ophthalmology (AAO) meeting in Chicago, IL, US in October 2018. This inaccuracy and imprecision is reported not only between uses for the same user but also between users. It can be a significant issue for applications where the therapeutic window is extremely narrow, such as injections in pre-term neonates diagnosed with ROP. Additionally, accuracy and precision of the delivered dose are critical to the fidelity of clinical data used to measure drug effectiveness, for example in dose-ranging studies. Chronic ocular diseases such as AMD and DME require regular intra-ocular injections, usually monthly. Frequent under-dosing could result in suboptimal clinical outcomes, whereas overdosing could result in complications, such as increased, sustained intra-ocular pressure (IOP) post-injection, requiring secondary interventions. It is therefore key to the treatment of such conditions to deliver the dose required accurately, every time. Figure 2: The Congruence Microlitre Dosing Syringe (MDS). Depressing the plunger rod to inject. In this variant, the dose is set at time of manufacturing and the user cannot set and deliver a different dose volume. Addition of the device subassembly to the filled PFS can be either manual or automated. 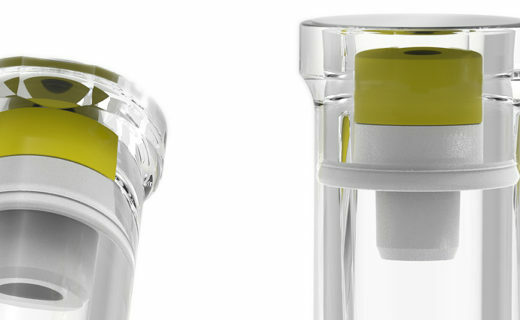 Both user-filled configurations allow a syringe integrated with the MDS to be packaged with a drug vial. The user-filled, user-set MDS configuration provides accurate and precise microlitre dosing with functionality equivalent to a conventional syringe. The MDS can also be customised to accommodate differences in drug viscosity, dose volume, look and feel, and PFS size/type. While the MDS can work with 0.5 mL PFS, compatibility with a 1 mL long PFS provides pharmaceutical and biotechnology companies a lot of flexibility, not only with PFS component sourcing but also with drug filling. The inbuilt mechanical advantage of the MDS with a 1 mL long PFS enables delivery of a drug solution with viscosity of up to 100 cp with an injection force of less than 30 N when injecting through a 30G, half-inch long needle. Figure 3. 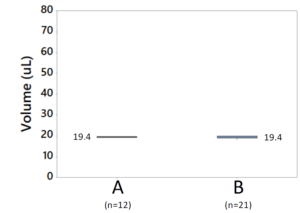 User data with MDS for a 20 μL dose using a 1 mL long PFS showing measured dose in laboratory setting (A), and measured dose for 21 users (B). 100% of the respondents were able to perform all steps of operation in an error-free manner. 87% of the respondents would prefer to use the MDS over other currently available options. 97% of the respondents indicated that they found the device comfortable to use. 90% of the respondents indicated that they found the device easy to use. The dose time was comparable with Lucentis® PFS. The MDS with a 1 mL long PFS outperformed conventional hypodermic syringes and 0.5 mL PFS. The open architecture of the MDS allows pharmaceutical and biotech companies to source syringe container closure components from their syringe or elastomer suppliers of choice. The MDS allows seamless integration with standard pharmaceutical fill-finish infrastructure and components despite the challenging dosing requirements in this therapeutic area. Since the MDS is a metered dose delivery system, the accuracy of the delivered dose is not dependent on accuracy of drug fill volume, as long as there is sufficient drug fill to account for dead space in the syringe and needle the correct dose will be delivered. Break-loose force also has no impact on the performance of the MDS. 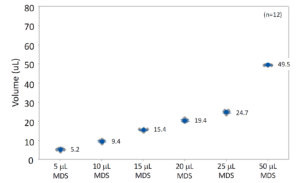 Figure 4: Various dose levels delivered using the MDS with 1 mL long PFS demonstrating accuracy and precision (average values shown). The MDS has been shown to be able to deliver a dose as low as 5 μL accurately (Figure 4) using a 1 mL long PFS. This capability allows for cost-effective dose-ranging studies. Pharmaceutical development requires demonstration of a dose-response. The drug material costs scale by the number of drug dose levels to be evaluated. The MDS can enable significant savings by requiring preparation of only one drug solution at its highest strength, with delivery of lower levels being achieved by adjusting the volume delivered. Previously, this was not possible because of the difficulty of reliably delivering accurate microlitre doses. Additionally, improving clinical trial design by modulating device-use parameters to ensure masking can easily be engineered with the MDS. The MDS will be available for clinical evaluation and use in 2019. Congruence Medical Solutions is developing other technologies relevant to the development and delivery of pharmaceutical agents for ophthalmic applications. For example, a device for accurately and precisely injecting extremely viscous drug formulations (>1000 cp) with a standard PFS is under development. Additionally, Congruence has developed a device for preclinical applications to inject drug volumes as low as 0.5 μL accurately by extending the capability of the MDS. The author would like to acknowledge the contributions from Lou Castanga, of CAE Consulting, and Lance Wetzel, Independent Consultant. “Data Book: Health Care Spending and the Medicare Program”. Medicare Payment Advisory Commission, Jun 2018. Storey PP et al, “The Impact of Prefilled Syringes on Endophthalmitis following Intravitreal Injection of Ranibizumab”. Am J Ophthalmol, 2018, epub ahead of print. Souied E et al, “Ranibizumab prefilled syringes: benefits of reduced syringe preparation times and less complex preparation procedures”. Eur J Ophthalmol, 2015, Vol 25(6), pp 529–534. Reed K et al, “Analysis of Intraocular Inflammation Following Intravitreal Injection of Eylea”. Retinal Physician, 2018, Vol 15, pp 26–30. “Preventing Silicone Oil Contamination of the Eye with Avastin Injections, Part I”. Spangenberg Shibley & Liber LLP, Apr 2017. Gerding H, Timmermann M, “Accuracy and Precision of Intravitreally Injected Ranibizumab Doses: An Experimental Study”. Klin Monatsbl Augenheilkd, 2010, Vol 227(4), pp 269–272. Meyer CH et al, “Accuracy, precision and repeatability in preparing the intravitreal dose with a 1.0-cc syringe”. Acta Ophthal, 2012, Vol 90(2), pp e165–166. 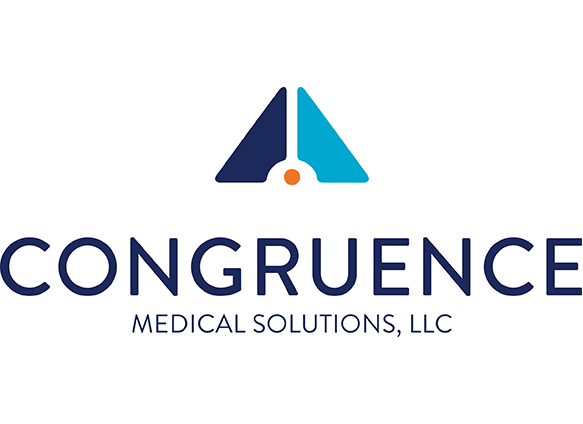 Congruence Medical Solutions is a science-based, technical innovation company focused on the development and supply of ophthalmic drug delivery devices. It's main product is a device for the delivery of accurate, precise microlitre intra-ocular doses using standard prefillable syringes. Alessio Bonati discusses the problematic interactions between drugs and their primary containers and goes on to introduce the Alba platform, Ompi’s range of primary glass containers designed to unify drug-container interactions over a product’s lifecycle.